Think you already have an unbeatable recipe for lemon cake? 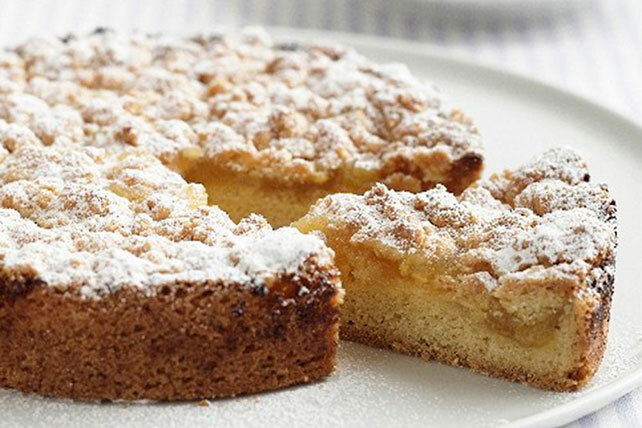 Try this Lemon Crumb Cake. We think it has what it takes to unseat the previous titleholder! Melt 1/2 cup butter. Mix 1-1/4 cups flour, dry gelatin mix and brown sugar in medium bowl until blended. Stir in melted butter; set aside. Mix remaining flour, baking powder and baking soda until blended. Beat remaining butter and granulated sugar in large bowl with mixer until light and fluffy. Add eggs, 1 at a time, beating well after each. Blend in sour cream and lemon zest. Gradually beat in baking powder mixture. Spoon into 9-inch round pan sprayed with cooking spray; top with gelatin mixture. Bake 40 to 45 min. or until toothpick inserted in center comes out clean. Cool completely. Balance out your food choices throughout the day so you can have a piece of this tart cake. Prepare using JELL-O Orange Flavor Gelatin and orange zest. Sprinkle lightly with powdered sugar just before serving.